You must make reservations at least 5 minutes in advance of the time at Gaslight. Free parking in our adjacent lot nightly during the week and all day and evening on weekends. Take the Silver Line on Washington Street to either Union Park or East Berkeley St. Walk 1 block South to Harrison and then its #560. Restaurant is available BRUNCH starting at $22/person and DINNER starting at $55/person for semi-private dining for groups of 13-36 people (both prices exclude alcoholic beverages, tax and tip). Private Party Facilities: Call us today for a Private Event from 100 to 175. We would be happy to host your special occasion! Our sister restaurant Cinquecento, an Italian trattoria also located in the South End with its own free parking lot has a private room that holds up to 48 for seated dinner and 75 for cocktail receptions 617-338-9500.
love it here! i will definitely come back. Lunch, and brunch are amazing. Would definitely recommend it. We were a party of 6 on a Saturday night and while the noise level was pretty high, we had an easy time chatting. We shared salads and a couple of orders of brussel sprouts to start and all were amazing. Everyone loved their entrees as well. Love the atmosphere and the food was fantastic. We had a terrific server, and the brunch food and drinks were delicious. We have dined here often and always enjoyed it. Two slight issues this time: 1) the men's room was out of hand towels, and 2) it seemed noisier than usual (perhaps unavoidable with the high ceilings and lots of tile). We will definitely go again, as it is a favorite spot for us in SOWA. I must admit, I am from San Francisco, somewhat of a "foodie" and I love to cook. It's a passion of mine and I am not a chef by any means. I have traveled the world and eaten in many restaurants around the globe, from hole-in-walls to 3 Michelin stars and everything in between. 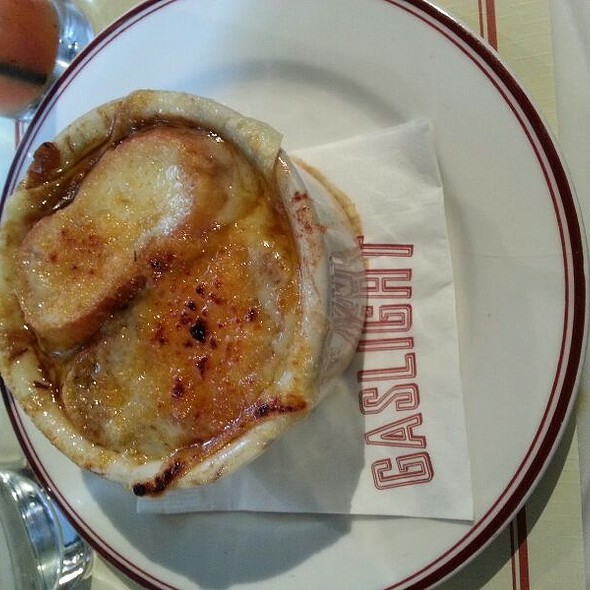 I am sad to say that for French Bistro fare, (and yes, I have actually eaten in the Bistro's of Paris and all of France actually) Gaslight did not make a very good impression. The food was mediocre at best. 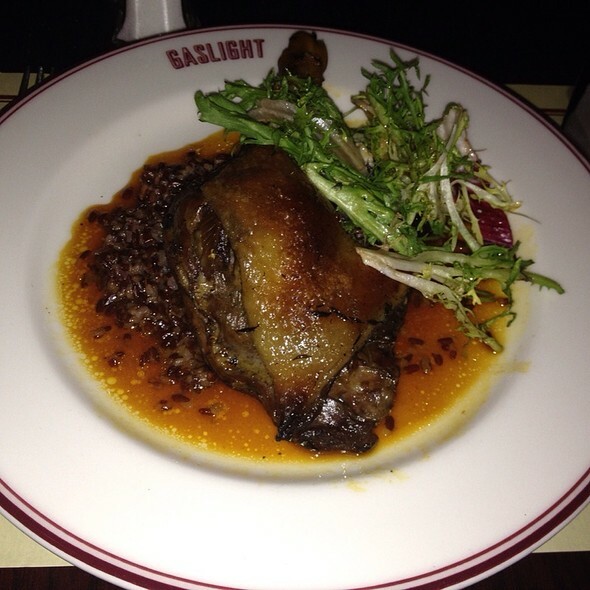 The duck confit was a disappointment in taste and flavor. Overall, not a place I would recommend. I am sorry Gaslight for this somewhat harsh review, but is it the truth. I just got married and my new husband and I decided to make a quick trip to Boston to celebrate. 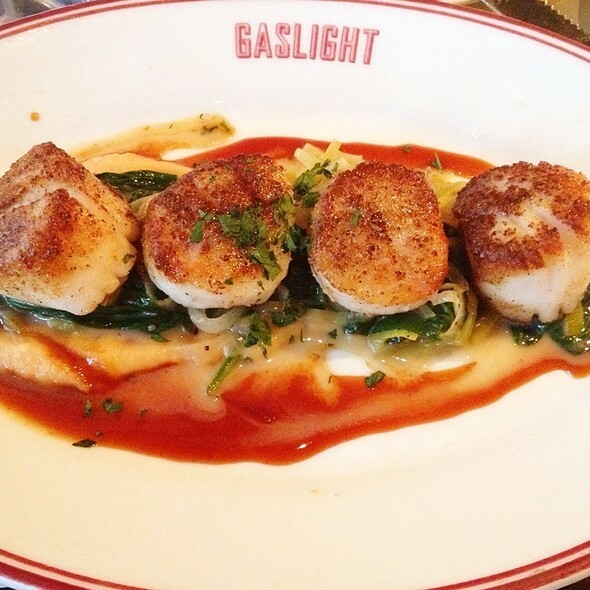 We found Gaslight on OpenTable and could not have been happier. The service was attentive and friendly without being fussy and intrusive. The atmosphere was exactly what we were looking for...a chic bistro that was still comfortable. The food was absolutely fantastic. The bar steak was melt-in-your-mouth delicious and my husband may never stop talking about the coq au vin (Monday night special). Every last thing about our experience was simply perfect. Many thanks to everyone there who made it so very special. Went for brunch and the food was great. It was at 11am and was super busy, the restaurant was full and we had to flag down the server a couple of times whenever we needed something. Not his fault, he was great but was just super busy. Food was excellent! The food was awesome as always! 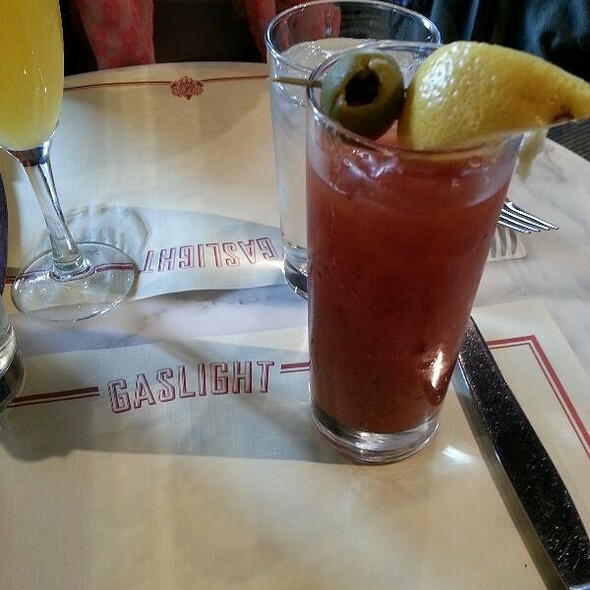 I can’t stop talking about how amazing gaslight brunch was on Sunday. It was so delicious and our waitress was amazing. I want to go back this weekend!! The rotisserie chicken was a bit on the dry side. But the quenelles were the biggest disappointment; they are supposed to be dumpling-like in their texture but these were not. And who puts cornichons in the sauce for quenelles? Love the French Bistro atmosphere. We did SOWA First Friday and made reservations for 8:00pm afterward. Perfect location, made for a fun night with friends. Loved the shaved beet salad and steak frites, my friend had moules frites. Yum. We were lucky and seated in a booth in the back and we could hear each other. This restaurant would be more of a go-to if it weren’t sooooo noisy, the sound just reverberates off the tiles and can make a fun evening work to talk. But we do keep going back, the service and atmosphere makes up for it! Delicious! And very very accommodating service. Reasonable pricing, and for seafood too! Will most definitely be making my way back again soon. Have always enjoyed Gaslight. Good food and service and love the free parking. Table was too small..we were 5 at the table . We are not large people and were uncomfortable with the seating. Will come again..and recommend to others. Excellent selection of gluten free options, very accommodating of food allergies. For about the last year and a half I have been going to Gaslight at least once a month. Always a consistent high quality experience. The food and service are outstanding. And to have free parking at a top notch restaurant in Boston is unheard of and fabulous! I highly recommend the dining experience there. Wonderful experience here for a special night out. This place continues to impress with excellent service and food, so we will definitely be back again soon! Some specifics: we started with a meat and cheese board and it came with 5 different meats and 3 different cheeses. Patrick (our server) explained each one in detail (what it was, where it came from, and a little story behind each). For dinner, my wife had the cod and she said it was one of her favorite restaurant dishes ever. I had the daily special (pork schnitzel) and it was equally impressive. Patrick and Isaac recommended a perfect white wine that might be our new favorite too. We like the Gaslight environment. Food was good though service was a bit slow which was surprising for a Sunday night. Our server was very pleasant. And wine selection was very good. No doubt we'll go back. And access to the parking lots adjacent to the restaurant is a positive, for sure. There's so much going for this place. Start with free parking across the street. In Boston! Next, great ambiance. I feel like this place is exactly what it sets out to be. Casual, lively, romantic, great spot for groups and friends, excellent food and service-- but never snobby, fair prices. For a French inspired place, I love that the menu is extensive and eclectic, which is not typical for French restaurants. There is pasta, and seared tuna on the menu, alongside the frogs legs and escargot. They begin the meal by delivering a warm baguette in a paper bag, with some fresh whipped butter. Our party of 5 shared three appetizers and a variety of dinners. There was nothing at all left on our plates. We didn't have room for dessert, but we ordered some anyways, and the molten chocolate cake was excellent, as you would expect. I have no complaints at all--and would highly recommend! 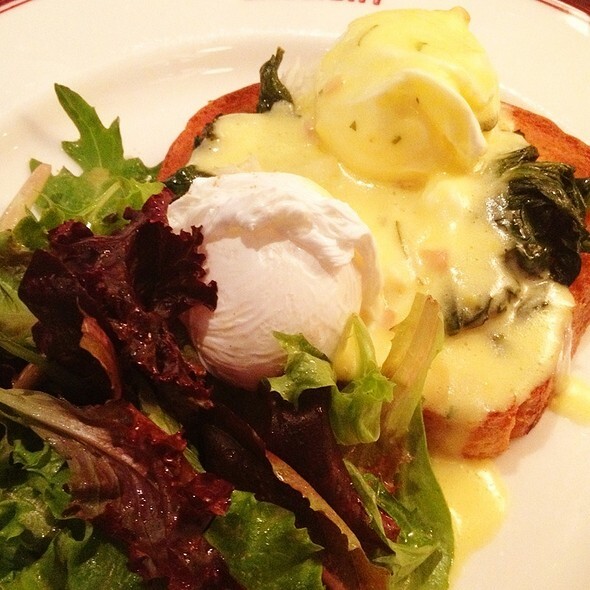 Fantastic service with amazingly good and consistent brunch food at very reasonable (for Boston) prices. We had a tough table of 9 right at kitchen door so that wasn’t good and they didn’t help with coats or overly crowded table setup but other than that — spot on and delicious! The food is perfect, but I just don't like the way how my waitress kept pushing us to order drink, order desserts or even check the bill. My friend and I only stayed in there for one hour in total count from the second I stepped into the bar to the moment I left the restaurant. Service was very pleasant but a little slow, especially at end of meal when all finished had to wait a while for final bill. I came to Gaslight based off of other reviews, but I’m going to have to disagree with the majority of folks. The food was mediocre, the chairs were extremely uncomfortable, the music was way too loud and the service was so-so. For the price, I would never recommend it. really nice ambiance and great service. we came to celebrate a birthday and they provided a very personalized experience, which we appreciated food. we ordered french onion soup, steak and frites, and the coconut cake. appetizer and main entree were good but not amazing - a little bit salty to be honest. coconut cake was delicious - sweet but not overwhelming; soft but with a bit of crunch. staff was friendly and attentive. My 3rd time here and always excellent. I had my 11 year old niece with me who has celiac disease. They were wonderful with providing a GF option. She loved the steak and eggs and they gave her a delicious fruit salad as well. Food was amazing. Kitchen was very slow. Took a very long time to receive appetizer and we were there over an hour before food was served. Very little feed back from waitress who disappeared and an hour late told us manager was in kitchen overseeing our food as it was taking to long. 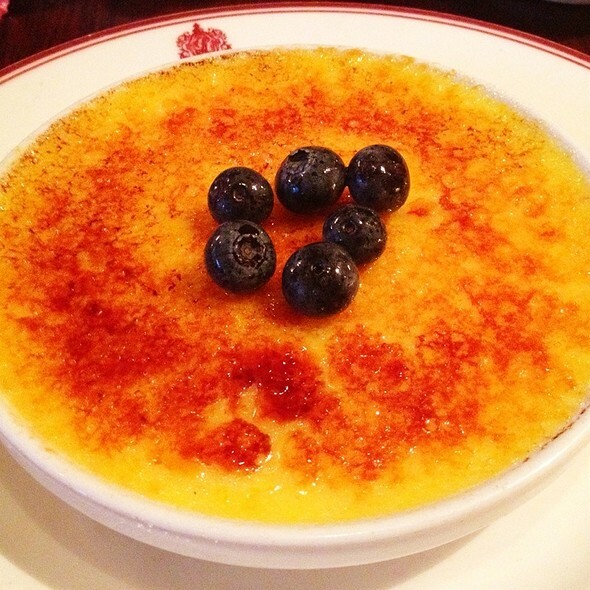 We love the Gaslight grill because the food is consistently excellent! The brunch menu has such a great variety. It offers breakfast as well as lunch items. Portions are substantial and they offer a prefixed menu which is a great buy!! Coffee, juice, raspberry, Linzer tart, main entree and fries for $11.95. I love going here for brunch. I had the Croque Madam and it was outstanding as usual. First batch of fries were disappointing, but replacement batch was crispy and delicious as usual. Server handled it very gracefully. Excellent all around, great tasting food, fast snd efficient service! My husband and I love Gaslight! Brunch with a two year old went well! There was a mishap with the service and they handled it perfectly. The food was excellent. Waiter was knowledgeable. Our brunch choices were good--timely served. We did have to wait a while for coffee refills several times. Our waiter was not the most attentive but it was very busy and he was very friendly and efficient. We love the atmosphere.